I fell in love with this Christmas wreath the moment I saw it. If you’re not new to my blog, you may already know that I am very sensible to beautiful recipes (that have to be tasty too). This Christmas wreath is so simple to prepare and adds such a beautiful decoration to your holidays table. I have prepared it more times and it is always a success. A mandatory thing is that you cannot overboil the broccoli florets. You really have to boil them for a couple of minutes and then transfer them into a bowl with cold water (better if with some ice cubes inside). This tactic will keep the green brilliant and it is important for the final result. I found this enchanted recipe in the populat Taste of Home site. I changed a couple of ingredients for more familiar ones and I can tell you that this Christmas wreath will be on my Christmas table this year too ;-). Wash the broccoli and cut the florets and use the rest for another dish. Put water to boil in a capacious pan. When it boils, pour in the broccoli florets. In the meanwhile prepare a bowl with cold water and add some ice cubes to it. Keep it close to the boiling pan. When the water begins to boil, set your timer to 2 minutes and after this time take the broccoli florets out of the boiling water using a perforated spoon and put them into the cold water. This will keep the broccoli color vivid. Prepare the dip mixing the cream cheese, mayonnaise, dill, garlic, shallot and olives. Mix until well combined and let it rest in the fridge for 2 to 3 hours. Take a big white round dish. Put a ramekin in the middle where you will put the dip. 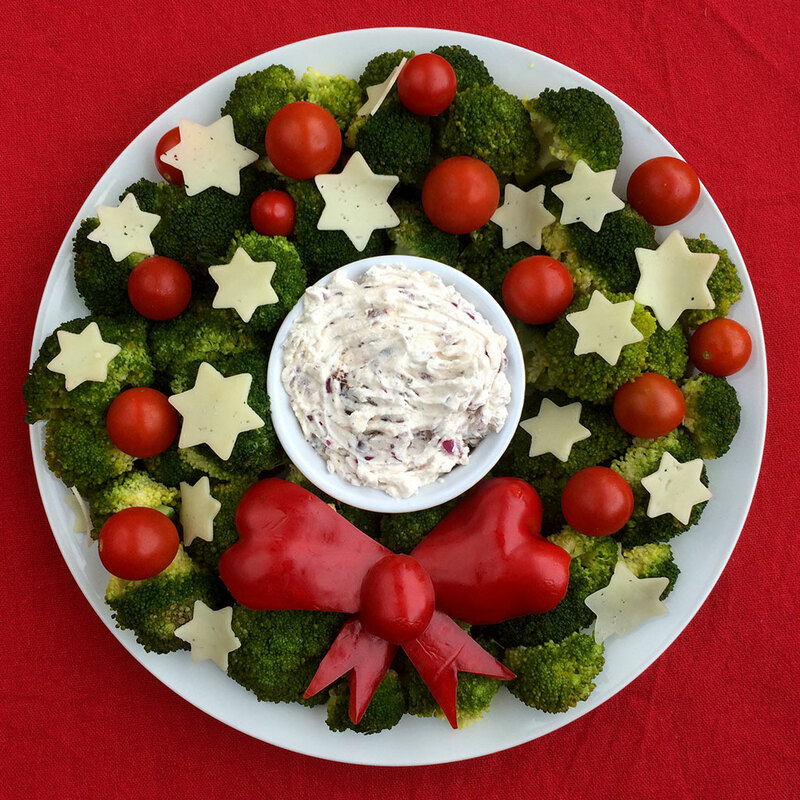 Arrange the broccoli florets creating the wreath. Add the cherry tomatoes. 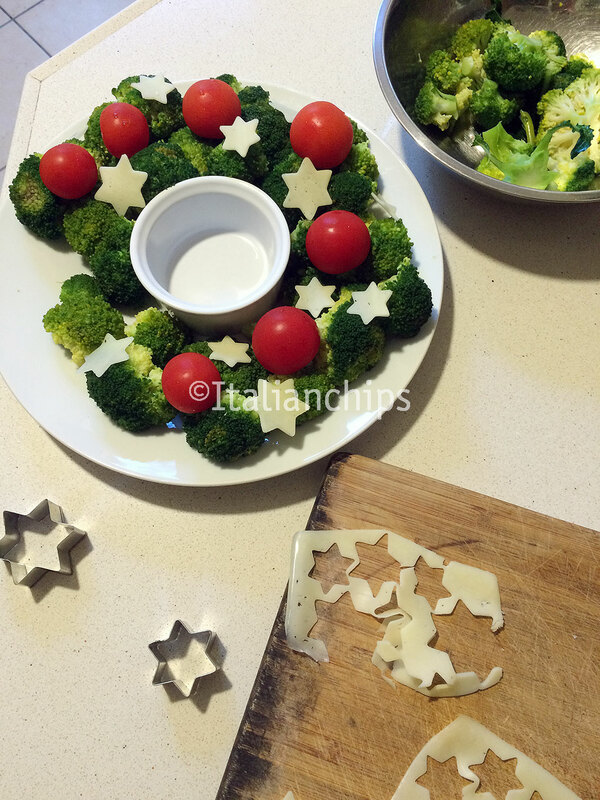 Using a star shaped cookie cutter, cut some stars from the cheese and place them between the broccoli and cherry tomatoes. Cut the red pepper forming the ribbon pieces and place them at the bottom of the wreath. 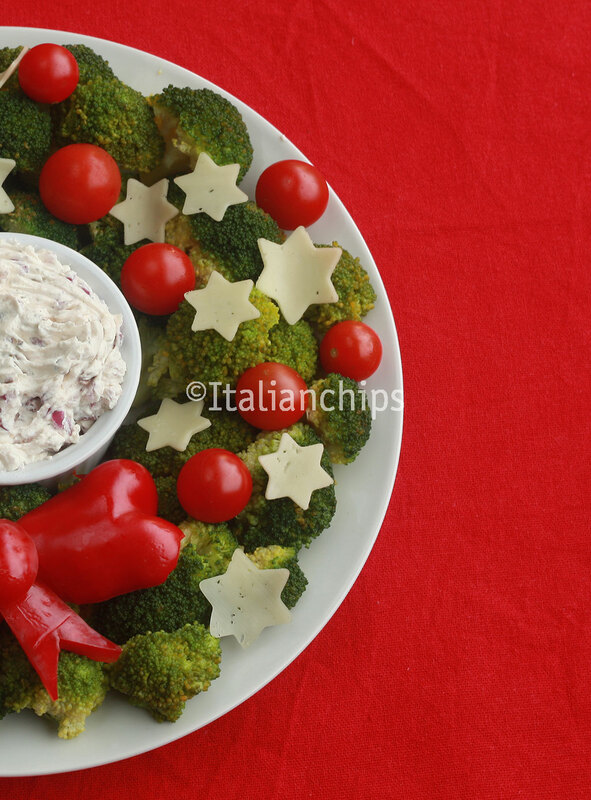 Merry Christmas and Buon appetito!